Mom died this morning at hospice. She’d been under hospice care (at home until a couple of weeks ago) since May. She’d been dealing with health problems and cancer for a few years. 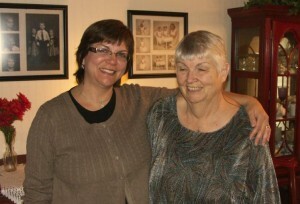 The picture was taken at her 70th birthday party at our house in October 2009. I am so sorry. I just went through this a week or so ago with my own mother, and I know how hard it is. Regardless of health, nothing ever really prepares you for it, nor is there ever a “good” time for such a loss. Peace be with you and your family. Your mom is no longer in pain. Becky, My thoughts are with you during this time. I am so sorry to hear of your loss. Sending hugs and love from Colorado. I am so, so sorry. Much love to you and your family. I’m sorry, Becky. Much love to you and your family. Becky, I am so very sorry for your loss. I noticed you’ve been quiet too, so I can only imagine the difficult journey you’ve been on lately. Please know that you’re kept in thought and prayer. I’m so sorry, Becky. I didn’t realize till this morning. You were such a solid support when my dad died. If there’s anything … you know, just holler. Thinking about you guys. I’m so sorry for being so late in sending my condolences. I’m so sorry for you. That photo is great, and your two look so lovely together. Hugs to you. I am so sorry for your loss. Sending prayers your way!! I’m so terribly sorry to hear that. All the best to you and your family at this difficult time. Becky, I am hoping this finds you in peace – so sorry I have been absent and missed your loss. Thinking of you all! So sorry to hear about your Mom. I did not see this until now. My deepest condolences, my thoughts are with you.